Corian is a brand of solid surface material created by DuPont and invented in 1967 by Donald Slocum. 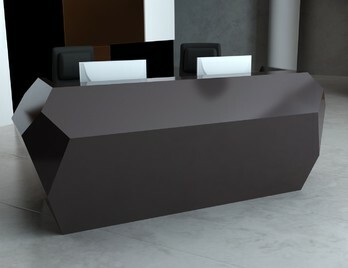 It's main use is for countertops which makes it an ideal material for reception desks and counters. A cross-section cuts shows consistent colour and pattern being evenly distributed, giving the name 'solid surface'. Corian is a very durable and flexible and is used by architects across the world as it can be styled and cut in a number of ways. The majority of these reception desks are delivered in modular pieces and then the joining lines and seams are smoothed and made invisible by the specialist installation team. 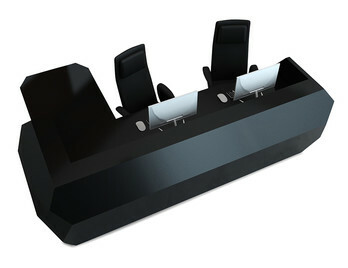 Stunning, eye-catching reception desks in a choice of three Corian finishes with optional back lit lettering. Cutting edge faceted design with bold geometric shapes. Bespoke solutions are also available. Stunning, eye-catching reception desks in a choice of three Corian finishes with optional backlit lettering. Cutting edge faceted design with bold geometric shapes. Bespoke solutions are also available. 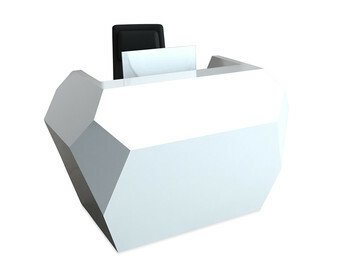 The Corian range of reception desks features unique designs that are true statement pieces of furniture. Ideal for spaces that benefit from striking pieces that are minimalist yet eye-catching. Designer furniture can often be a large investment but durability is guaranteed as these reception desks are built to the highest possible standard using well-sourced materials and the best manufacturing processes. The reception space of any office, workspace or retail area is one of the most important areas to consider when furnishing and refurbishing. For businesses, communication is key and central to success. 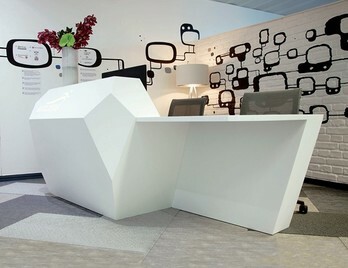 As the reception area is the space in which the first point of contact is made – with potential clients, existing customers and new visitors – it is vital to make the best first impression possible and by selecting cutting edge designer desks you can ensure that the image of your business is protected. As investing in such pieces can be pricey we aim to provide the highest level of customer service to make this process stress-free. We are able to offer bespoke sizes of the Corian range to suit your specific needs and our in-house design team offer a free 2D and 3D visual service to ensure you utilise the space you have available in the best possible way. We are happy to help with you in selecting the appropriate products for your setting. 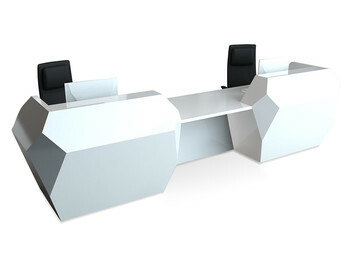 Buy designer reception desks from Office Reality and receive your order for free delivery to UK mainland addresses as standard.